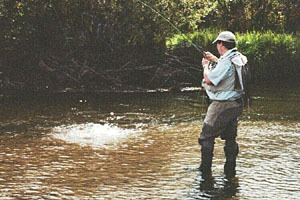 Dennis fell in love with fly fishing as a young boy, while sitting on a stream bank watching his father fly fish. His introduction to fly tying also came at an early age, when Santa delivered the well-remembered "Basic Fly Tying Kit" one Christmas. That was over 40 years ago. 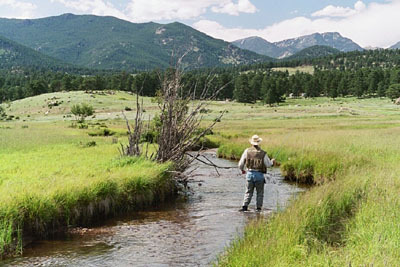 Today, Dennis guides and instructs in Colorado and enjoys sharing his many innovative fly patterns. The birthplace of the SnoBall Beetle lies in the flood plain of an ancient glacial moraine in Rocky Mountain National Park. Through the picture-postcard valley flows the headwaters of the Big Thompson River. Here the "Big-T" supports a thriving all-wild trout population of predominantly brown trout. Ants and beetles make their spring debut with the receding winter snowpack and quickly become a significant portion of the food supply for these fish. As spring becomes summer, knee-deep meadow grasses will briefly offer up their banquet of hoppers as well. At 9,000 feet of elevation, major aquatic insect hatches are sparse – this is terrestrial territory! 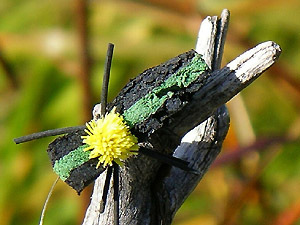 The SnoBall Beetle is a third cousin, twice removed, from the notable Chernobyl Ant. As an avid fly tier I subscribe to the theory; "If it ain’t broke – fix it," and the Chernobyl Ant was just begging to be tinkered with. Many variations later (all extensively field-tested in my liquid laboratory) I arrived at the SnoBall Beetle pattern as it appears today. The name derives from the deer hair "sight indicator". Tie the indicator in whatever colors you like – white and fluorescent chartreuse work best for me and I carry both. The white is more difficult to see if you’re fishing in heavy foam lines, yellow and chartreuse really stand out in dim light-levels at dawn and dusk. The SnoBall also makes an excellent "strike indicator" when fished with a nymph dropper or small, difficult to see, emerger patterns riding low in the surface film. Last spring I was fishing one of the many ponds at Elktrout Lodge near Kremmling, Colorado, with deep drifted midge pupae’s. After having a few fish inhale my strike indicator as it floated on the surface, I decided to put a hook in it. I swapped the cork indicator for a #12 SnoBall Beetle and in minutes my rod was bending to the strain of a large Donaldson Rainbow, beetle in jaw, headed for the other side of the pond. As the morning sun warmed the water, callibaetis mayflies began to dance on the liquid mirror. A size 14 parachute Adams replaced the midge pupae and a real comedy act began. Big bows would sprint across the pond when the flies hit the surface, then slam on the brakes and turn toward one fly, then the other, trying to decide which bug to take first. They reminded me of kids in a candy shop and the beetle won more than its fair share of the decisions! 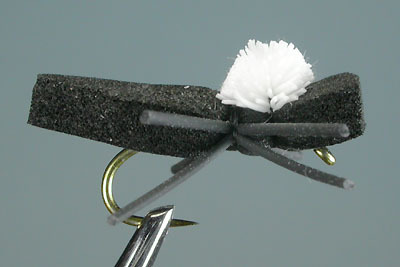 Dress this fly on 2X heavy wire, wet fly hooks. The keel effect of the heavy wire helps the fly land in the upright position. The heavy wire is also more bend-resistant for those occasions when you catch overhanging grasses on your cast. Give a good tug to free the fly. However, don’t pick the freed fly up and off the water when this happens. Many times the fly "jumping" from the grass is just what it takes to trigger a strike. This will be a frequent experience if you’re fishing the bug where it needs to be fished – tight to the bank! 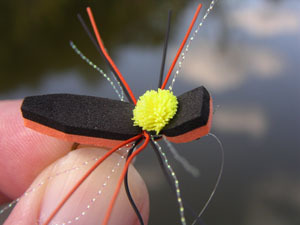 This fly should land on the water with a good ‘splat’ so delicate presentations normally aren’t required. 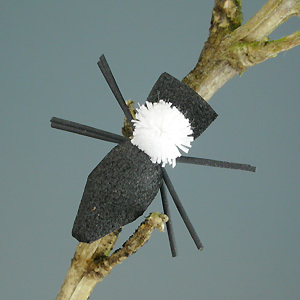 The SnoBall Beetle is a very simple pattern to tie and offers exceptional durability. You’ll want to put a drop of "Zap-A-Gap" super glue on the thread wraps when the fly is finished to keep the foam from rolling on the hook shank. Next, the "fifty-cent secret" - strip the round rubber legs off the sheet in two (attached) strands at a time. Tie them directly to the side of the foam in this (still attached) configuration, then separate and trim upon completion. It’s this subtle detail that results in the uniformly splayed legs. In this part of the country, wind is an almost constant factor while fishing. Consequently, I prefer 7½ foot "weight forward" leaders tapered to 3X. To this, I’ll add a couple feet of 4X, fluorocarbon tippet. Weight forward leaders really help turn over the fly and facilitate fly presentation while casting into gentle 30-mph breezes. On flat water, where fish have more time to examine and reject your offering, drop down to 5X if necessary. 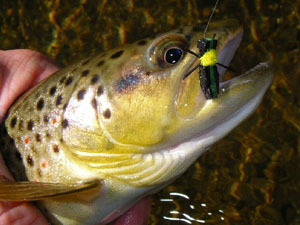 Anything less is an invitation to break-off as fish tend to take this fly in the same aggressive manner as hoppers. Friends and fellow anglers have reported fishing this creation on many of the West’s most demanding and hard-fished waters. My good friend and fly tying mentor, Charlie Craven, fished Colorado’s Frying Pan River with his oldest son this past Fathers Day. His e-mail read: "don’t bother fishing the ‘Pan’ with a SnoBall Beetle, we just caught every fish in the river on the thing!" Charlie is a fly designer for Umpuqa Feather Merchants, co-creator of the BC Hopper - among other notable patterns - and one of the finest young fly tiers and fishermen I’ve ever known. When he gets excited about a fly, I take it to the bank. I’ve personally fished the SnoBall Beetle on the Frying Pan during a major BWO hatch, and caught numerous fish while my best "olive" patterns were being rejected. Charlie offers this opinion: "it catches a lot of fish because they haven’t seen 10,000 other flies just like it that day." Who knows best but the fish? I don’t argue with success! I’m not a warm-water fisherman myself, but acquaintances that pursue panfish on stillwaters suggest tying the SnoBall Beetle with much longer legs to impart an enticing action when "popping" the fly with a short, jerky retrieve. Retaining the original design, different colors of foam and legs also could be used to accommodate the discriminating pallets of your local bluegill, bream and crappie friends. "Ever-Ready Beetle," "Timex Beetle," "Fifty-Fish-Fly," and "Fish-In-A-Barrel Fly" have affectionately replaced the SnoBall Beetle’s original namesake by many converts. Call it what you like but tie and try a few on your favorite waters. You might find throwing SnoBalls in Summer is just what the doctor ordered.